In The Tao of Steve we learned that guys don’t do opera, in Swingers we learned that every guy needs a wingman and in the movies of Kevin Smith, we learned that guys gossip more than a sorority. Yet, having worked in the theatre, I can confidently tell you that unless they’re desperately trying to woo a date or are over the age of 55, straight guys seldom do theatre. With undoubtedly this in mind and in an effort to blend theatre together with Swingers and Chasing Amy, writer/director Mars Callahan got in touch with his inner screwball and served up What Love Is, a film so foul it would make Kevin Smith blush and one where dialogue whips by so quickly that the Gilmore Girls heroines would tell them to slow down for fear of a speeding ticket. A raunchy hybrid of sitcoms and confessional theatre and set during a particularly raucous Valentine’s Day night, nothing about this wicked talk-a-thon feels authentic as audiences find themselves half expecting applause or canned laughs after certain punchlines and characters actually enter the room on cue like Norm on Cheers or Kramer on Seinfeld. When he discovers empty closets and suitcases by the front door, Tom (Cuba Gooding Jr.) reads the obligatory Dear John letter left for him by his girlfriend who’s decided to walk out on him after three years of cohabitation and realizes that in addition to his heartbreak, he must contend for an impromptu party he’d obliviously decided to throw to celebrate what he’d hoped would be his engagement. Before the other guests arrive, his four boyhood friends trickle in one-by-one (and always on cue) and, with their varied outlooks and attitudes offer Tom advice and speeches for the film’s opening forty minutes that seem so loud, chaotic, and lewd, one wonders if Callahan, perhaps budget strapped, offered a bonus to whichever actor can deliver his monologues the fastest, thereby saving precious film stock and shortening the running time to roughly ninety minutes. Matthew Lillard sets the film’s tone early on as the self-described misogynistic and homophobic Sal who, saddled with the film’s most shocking yet memorable lines, attacks his character with a ferocity I didn’t realize the actor had in him and it’s easy to imagine that his agent will be mailing his entire opening segment to David Mamet in the hopes of scoring a role as one of the prize-winner’s legendary boors. 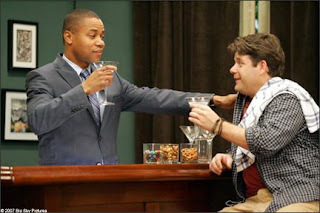 In fact, Lillard is so repugnant yet compulsively fascinating that the other actors are nearly helpless in his wake, although the fault seems to lie largely in the script which finds Andrew Daly faced with portraying a one-note, ridiculously penned gay stereotype, Sean Astin relegated to portraying a Birkenstock wearing, granola eating New Age hippie tired of always being labeled as the friend to beautiful women and the writer/director, who turns in a nice performance in an uninteresting role as the happily married Ken. How and why these characters still remain friends is a mystery as San Francisco Chronicle’s Peter Harlaub memorably described his view of the group by asking viewers to “imagine if the pack from 'The Breakfast Club' were still stuck in detention twenty years later.” While they repeatedly explain that they’ve known each other since grade school, the men in What Love Is prove just as often that they haven’t evolved much since then and it’s all the more apparent when, almost halfway through the film women begin arriving at the party (played by Gina Gershon, Anne Heche and others) and as they walk through the door, must endure starring in a stripper fantasy. In other words, consider this reviewer annoyed and while I held out hope that once the two sexes would coexist in the same scene, sparks and words would begin flying, the film’s final act proves to be its most lifeless when cliché induced unsatisfactory conclusions are reached. As rude and clipped as the opening forty minutes were of the film were, had Callahan kept up the pace and managed to write the rest of the supporting players with as much force as he did for Lillard’s Sal, it may have been a successful melding of theatre and film, yet as released and given a bland title destined to blend into the video store shelves, there’s not much to love about What Love Is.